Here is a series of pictures of a Colonel Coventry entering Jerusalem in 1916. 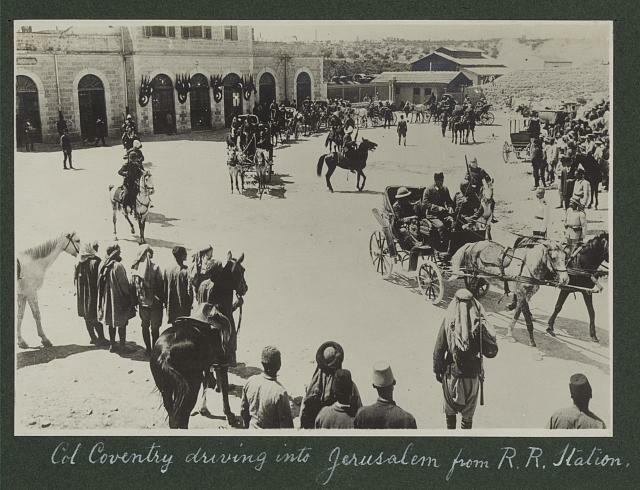 "Coventry" would suggest an Englishman, but the year places his arrival in the middle of World War I, and Jerusalem was under Turkish control. 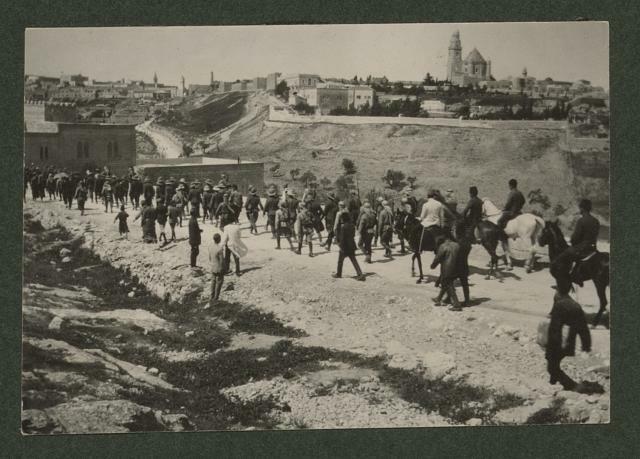 "Col. Coventry and officers approaching the Jaffa Gate." The next picture shows Coventry and his officers in carriages heading up from the Hinnom Valley towards the Jaffa Gate. 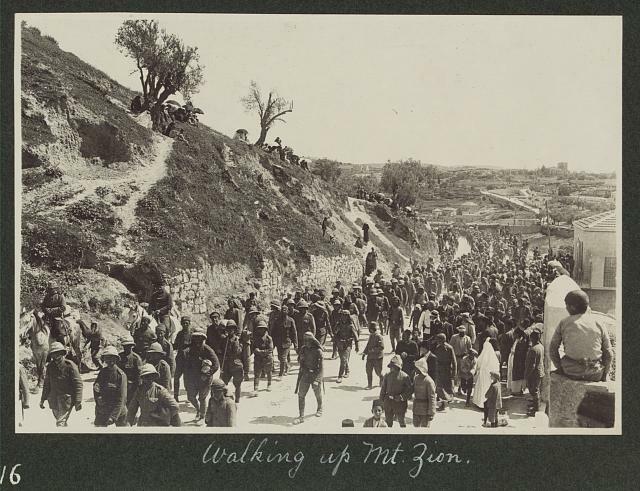 A third and fourth picture show men marching toward the Old City. They appear to be wearing British uniforms. officers were riding in carriages. They appear to be British. ﻿Research shows that the men were prisoners of war, captured by the Turks in an early battle in the Sinai close to the Suez Canal. "On the 22nd April the Royal Flying Corps reported that new bodies of enemy troops were at Bir el Bayud [approaching the Suez Canal] Upon receipt of this information, General Wiggin obtained leave to attack the enemy at Mageibra that night. General Wiggin, with Lieut.-Colonel Coventry, accompanied the raid to Mageibra. In the meantime the post at Oghratina was attacked at 5.30a.m. The Officer Commanding at Oghratina reported that he was again heavily attacked on all sides. This attack carried the post, all the garrison of which were either killed, wounded, or captured. Qatia itself was attacked about 9.30 a.m. Lieutenant-Colonel Coventry was detached with one squadron from General Wiggin's Force to operate towards Qatia. Unfortunately, this squadron became involved in the unsuccessful resistance of the Qatia garrison, and, with the exception of some 60 men and one officer who were able to disengage themselves, fell with it into the hands of the enemy." 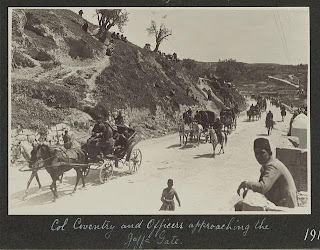 The British soldiers, led by Lt. Col. Coventry, were taken by rail by the Turks to Jerusalem. Their fate afterwards is not known. And I spotted in the background the plot upon which the future Menachem Begin Center was to be built. Born on 26 February 1867 in Marylebone, London, England, died 2 June 1929. One of the opening chapters of "Palestine 1917," a historical novel by a British author, details stories of captured British troops in Jerusalem and environs in the months before Allenby's campaign. The photos you show dovetail well with his "fictional" descriptions of the way the Turks treated the Brits. In the novel, at one point, the British officers are given a tour of the Holy City as if their Turkish guards were tour guides.